A foldable helmet, a brutalist bike clamp and a canvas bag for the style-conscious rider are among our top 15 cycling accessories to give as gifts this Christmas. Tanned leather details offset the water-resistant waxed-cotton canvas body of this cycle bag. Produced by Brooks England, the Pickwick Backpack has a rolltop that closes inwards, to keep the front flush and possessions safe while riding. A padded compartment inside has enough space for a laptop for those commuting to work, while another secret pocket is located at the back. The Apple Watch Series 4 automatically detects the start of a ride, so users can keep track of their mile count. It also allows users to share activities with friends and create new monthly challenges. Another benefit of the device is the built-in cellular service, which allows riders to make and receive calls wherever they are on route, without the need of an iPhone. The brutalist-style BikeBlock allows cyclists to park bicycles in their apartments, without compromising on the interior aesthetic. Tires slot into a chunk carved out of the concrete block, which weighs 18 kilograms to prevent tipping once clamped into position. Leather also lines the underside so as not to scratch floors. This minimal, over-the-shoulder bag by accessories brand Moshi allows cyclists to switch from bike to foot effortlessly. The bag's main handle crosses over the body and boasts a quick-release strap, so it's easy to take off. An additional strap is included to bolster support when on the move. Zips are hidden in the bag's detailing to help prevent theft, while the lightweight and durable fabric is both weather-resistant and cut-proof, to keep laptops, keys and cards safe. Aptly named Lochness Bike Lock, this device twists in various ways to lock onto bike racks, or mould around handlebars and baskets when not in use. Designer Francesco Toselli created the shape-shifting lock for Palomar to provide a quick and easy way to secure bicycles in comparison to more rigid designs. Toselli chose a rubbery silicone covering so as not to scratch services. Bike helmet brand Closca's Brilliant headgear is made of three concentric foam pieces that collapse downwards, allowing the helmet to fold up and be stored in a bag. A series of accessories also help keep cyclists safe and warm during winter, such as a reflective section of fabric at the back and a wool visor. These wearable light clips by Swedish company Bookman Urban Visibility will keep a style-savvy cyclist safe while riding on urban roads at night. Designed to clasp onto coats or backpack, the powerful device features white and red LEDs for both front and rear wearing. 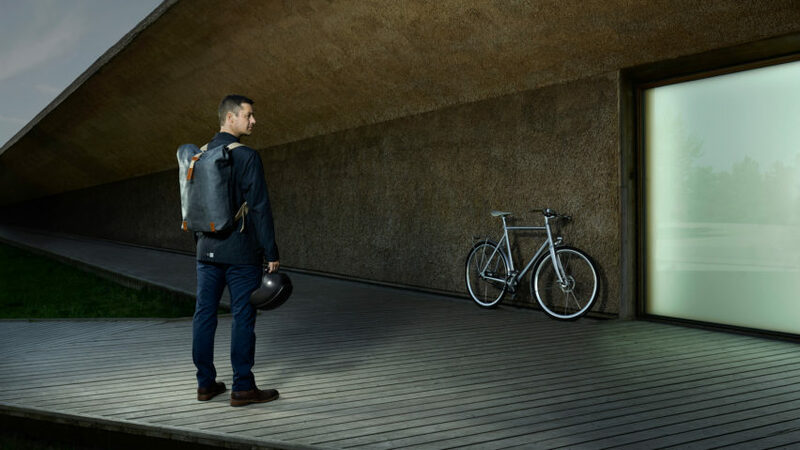 Lights are rechargeable and can last for up to 60 hours on a single charge. London-based Brick Lane Bikes used rainbow hues to give character to this set of allen keys, which come in handy for quick repairs. There are nine keys in the set, and the spectrum of colours and sizes ranges from yellow up to green. Routes in major cities like New York and Buenos Aires, mountain ranges, and rural trails are among the rides detailed in this travel guide by Lonely Plant. Tracks vary from the more gentle landscapes of Corsica and Tuscany to adventures up southern France's Montt Ventoux, to encourage both advanced and novice cyclists to venture beyond the city commute. White spots display on the lid of Joseph Joseph's compact Dot bottle each time it is refilled during the day, making it easy for a cyclist keep track of their hydration. The dots count up to four every time the cap is screwed on the 600 millilitre bottle. Lids come in a variety of bold and bright colours to offset the clear see-through base or match tinted bottoms. Cyclists press this ball-shaped bell to operate one of three sounds – a classic ringing, loud hooting or the sound of a whistle – which change each time the device is removed and replaced. Odo Fioravanti's playful Nello secures to handlebars via a strong magnet, making is easy to take on and off. It is also battery operated. Navigation, activity tracking and an alarm system are integrated into this smart bike accessory called the SmartHalo. The multi-functional device permanently attaches to handlebars and pairs with the owner's smartphone to sync with the application. Information, such as turning signals, is shown through lights patterns on its simple circular screen. Copper details, leather handlebars and a leather seat offset the matt black frame of the unisex Tenby 7 Speed City Bike, designed for countryside and city commutes "in style". Tenby has also created a series of baskets, bells and accessories to decorate the bike. This all-black rain jacket by Swedish brand Stutterheim is ideal to slip on for drizzly cycle rides, with satin lining the inside for added warmth. A concealed zipper runs up the front of the jacket, while the cuffs are elasticised to ensure that no water gets up sleeves. These gloves by cycling brand Rapha come with a stretchy, thermoregulating thermo-roubaix fabric, which keep hands warm throughout chilly bike rides, and a leather palm, to ensure the handlebar can still be gripped. The sleek black gloves are simply detailed with a reflective Rapha logo that illuminates at night time, while a micro-fibre on the thumb is designed for wiping noses. Note: entries in Dezeen's 2018 Christmas gift guides have been paid for or include affiliate links.